The sleep here is not merely relating to slumber upon the bed but the unconsciousness brought about through over indulgence in escape: movies, sports, video games, hobbies, pleasure, eating. I understand we all need recreation but too much can make us comatose instead of merely giving us rest. There are treasures within us that need to be unearthed and time that could be spent digging is wasted in life dulling slumber. The lack of time spent mining the treasure within leads to poverty. The true riches of life cannot be purchased with silver and gold. Though some may have an abundance of this world’s wealth, their soul can be impoverished. Money definitely can assist in the journey but too often money is considered the end instead of a means to the end. Money is not always a profitable exchange for time spent, especially when it comes to time spent away from family and friends. Some jobs, though they pay a lot, may cost you more than you earn. There is a poverty that is not reflected in a bank statement but is evident in broken families, drug abuse, and the volume of pills medicine cabinet. Though the dreamland of popular opinion and rationalizations may be less challenging than truth, it is a wasteland shrouded with darkness and yields unfulfilled living. Don’t squint your eyes in denial, open them wide and let them adjust to the light of the truth. The burden that goes with sustaining falsehoods is much heavier than sustaining truth because truth sustains itself. The truth does bring freedom. There is a saying that all men die but few men truly live. Most people sleep their lives away avoiding challenges, conflict, and the uncomfortable. Jesus taught that we would enter the kingdom through much tribulation. In order to have a full life, we have to embrace all of life, which means the not so pleasant parts too. Let the hope of the gospel reinvigorate you to live, to face the challenges, to welcome the conflict, and to endure the uncomfortable. For all that choose to do so will be satisfied with the bread of life; righteousness, peace, joy, love, and true fulfillment. 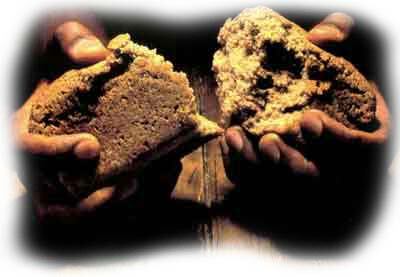 Endeavor to meet every day with the hope of receiving your daily bread just as The Lord’s Prayer indicates. God has given us abundant life through Jesus Christ. May we learn to live well by His provision through the power of the Holy Spirit. This entry was posted in Inspirational, Love and tagged 2013, Depression, Drug Addiction, Faith, Family, God, Good News, Happiness, Inspiration, Inspirational, Jesus, Joy, Love, Marriage, Meditation, Motivational, obesity, Self Help. Bookmark the permalink. Winter is coming but Men don’t hibernate!